Lieutenant-Colonel Kerrison at first avoided a sword thrust from the French dragoon officer, but his pelisse was torn. He replied immediately with a heavy sword blow to the Frenchman's head which knocked both men off their horses. Kerrison's arm was broken in two places and his opponent was killed. 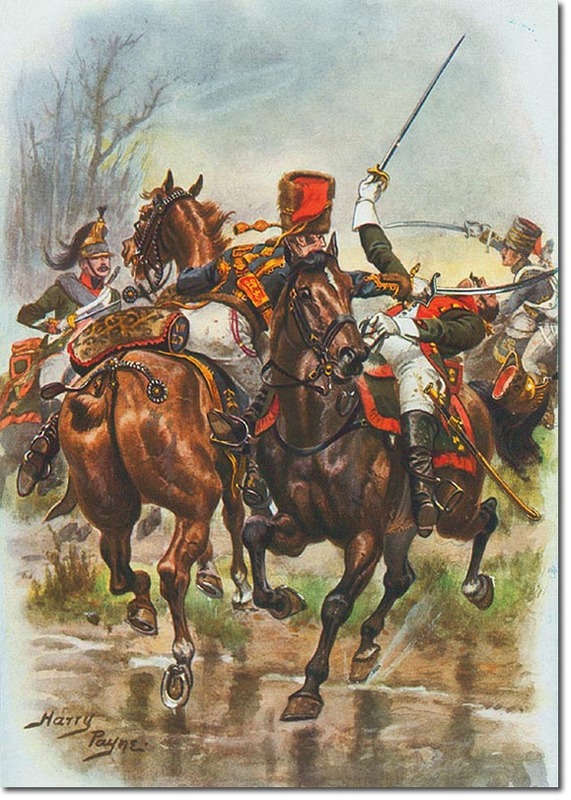 The fighting carried on around him, and although the hussars were outnumbered, they won the fight and were able to help their officer back to Lamote. The illustration is by Harry Payne and was published in the regimental history by CRB Barrett. The uniform is not accurate because he has painted gold lace and braid on Kerrison's pelisse when it should be silver. The shabraque on his horse is shown as blue and gold, but the full dress shabraque at that time was white and gold. It is unlikely that the shabraque would have been used in the Peninsula, let alone whilst on patrol. The fur busbies were quite tall at this stage and are correctly drawn. It is difficult to imagine how they stayed in place as there were no chin chains, and cap lines do not appear to be linking cap to body.